The Yamaha Flugelhorn Silent Brass System is the brass player's best friend and your landlord's dream! This complete, sound- proofed electronic studio is small enough to clip on your belt. 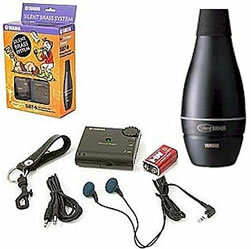 It consists of a pickup mute, stereo earphones, and digital processor (the "Personal Studio"). With it, you can blow with all your might, and produce hardly a whisper. Inside the earphones, you will be enveloped by a sound so rich and full that you'll feel like you're standing in the middle of a concert hall. Powered by 9V battery. Each system includes the ST9 Silent Brass Module, Personal Studio, headphones, pickup mute, locking cable, belt loop/strap, and 9V Battery. This model is for flugelhorn.